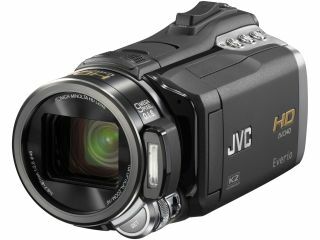 JVC may have already released info on a new addition to its pocket cam range, but the company has made sure not to let down its prosumer users with the announcement of the JVC GZ-HM400 Everio camcorder. Not only does it look sturdy enough to survive a nuclear holocaust, the camera sports a meaty 1/2.33-inch 10.3 Megapixel CMOS sensor with Bayer Array RGB Colour Filter. This means picture perfect colour reproduction all around. For those who love to recreate the super slow-mo niceties of Planet Earth – we're guessing you replace Great White Shark with badger though – JVC has added a 5000fps high-speed recording mode which will satiate your needs. Recording footage is done to 1080p 24ps quality and this is perked up with JVC's very own HD Gigabrid Premium II Engine's super high-band processor. Other features include face detection for up to 16 people, 5.3MP simultaneous stills shooting while filming 1080p footage and optical image stabilisation. Memory wise, the HM400 has 32GB internal memory and this can be expanded with the inclusion of an SD/SDHC card. The GZ-HM400 is out now and will cost around £700. Go to JVC.co.uk for more details.